Pep Guardiola has won just one of his past eight managerial meetings with Jurgen Klopp in all competitions (D3, L4), and is winless in the most recent four (D1, L3). Liverpool’s return of 20 points is their joint-most after eight games of a Premier League campaign, having also done so in 1996-97 and 2008-09. With Chelsea, Liverpool and Manchester City all yet to suffer a league defeat this term, this is just the second time in Premier League history that as many as three teams have gone unbeaten in their opening eight games of a single season (also 2011-12, with Manchester City, Manchester United and Newcastle United). Manchester City had 51% possession at Anfield; their lowest in a Premier League game since Pep Guardiola took charge of the club. Manchester City striker Sergio Aguero has played 10 matches in all competitions at Anfield in his career (eight with Man City, two with Atletico Madrid), failing to score in any of those games. 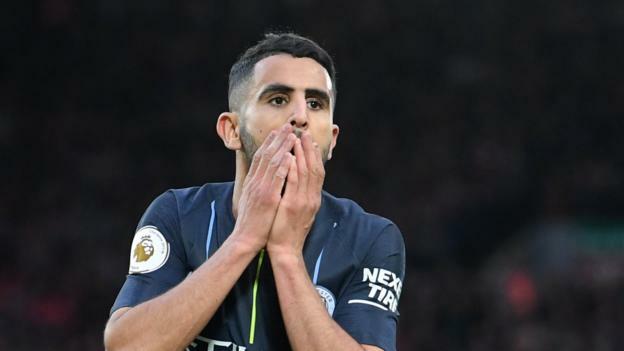 Among players to have taken at least 10 penalties in the Premier League, only Juan Pablo Angel (50%) has a lower success rate than Manchester City’s Riyad Mahrez (58%). After the international break, Manchester City return to Premier League action with a home game against Burnley on Saturday, 20 October (15:00 BST). On the same day, Liverpool face a trip to Huddersfield’s John Smith’s Stadium in the evening kick-off (17:30 BST).